in memorial of Yasinska Α Vyacheslav, (Ясінського В’ячеслава Андрійовича) 1957-2015 . I shall post below the problems, as soon as they translated and posted in English in aops. Rectangular sheet of paper $ABCD$ is folded as shown in the figure. Find the rato $DK: AB$, given that $C_1$ is the midpoint of $AD$. Medians $AM$ and $BE$ of a triangle $ABC$ intersect at $O$. The points $O, M, E, C$ lie on one circle. Find the length of $AB$ if $BE = AM =3$. Given circle arc, whose center is an inaccessible point. $A$ is a point on this arc (see fig.). 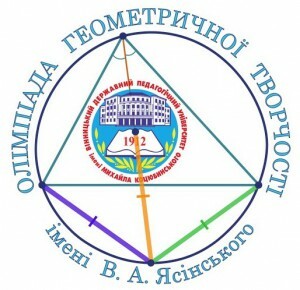 How to construct use compass and ruler without divisions, a tangent to given circle arc at point $A$ ? Diagonals of trapezium $ABCD$ are mutually perpendicular and the midline of the trapezium is $5$. Find the length of the segment that connects the middles of the bases of the trapezium. The four points of a circle are in the following order: $A, B, C, D$. Extensions of chord $AB$ beyond point $B$ and of chord $CD$ beyond point $C$ intersect at point $E$, with $\angle AED= 60^o$. If $\angle ABD =3 \angle BAC$ , prove that $AD$ is the diameter of the circle. Given a trapezoid $ABCD$ with bases $BC$ and $AD$, with $AD=2 BC$. Let $M$ be the midpoint of $AD, E$ be the point of intersection of the sides $AB$ and $CD$, $O$ be the point of intersection of $BM$ and $AC, N$ be the point of intersection of $EO$ and $BC$. In what ratio, point $N$ divides the segment $BC$? The two sides of the triangle are $10$ and $15$. Prove that the length of the bisector of the angle between them is less than $12$. In an isosceles trapezoid, one of the bases is three times larger than the other. Angle at a greater basis is equal to $45^o$. 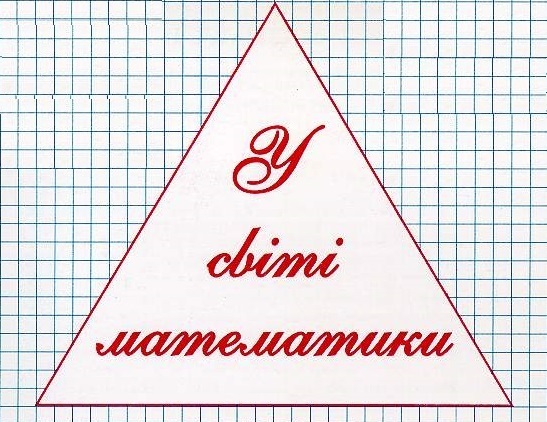 Show how to cut this trapezium into three parts and make a square with them. Justify your answer. In the isosceles trapezoid with the area of $28$, a circle of radius $2$ is inscribed. Find the length of the side of the trapezoid. Prove that if all the edges of the tetrahedron are equal triangles (such a tetrahedron is called equilateral), then its projection on the plane of a face is a triangle. Given circle $\omega$ and point $D$ outside this circle. Find the following points $A, B$ and $C$ on the circle $\omega$ so that the $ABCD$ quadrilateral is convex and has the maximum possible area. Justify your answer. Three points are given on the plane. With the help of compass and ruler construct a straight line in this plane, which will be equidistant from these three points. Explore how many solutions have this construction. ABCD is a rectangle. The segment $MA$ is perpendicular to plane $ABC$ . $MB= 15$ , $MC=24$ , $MD=20$. Find the length of $MA$ . In the triangle $ABC$ , the angle bisector $AD$ divides the side $BC$ into the ratio $BD: DC = 2: 1$. In what ratio, does the median $CE$ divide this bisector? In the tetrahedron $DABC, AB=BC, \angle DBC =\angle DBA$. Prove that $AC \perp DB$. In a circle, let $AB$ and $BC$ be chords , with $AB =\sqrt3, BC =3\sqrt3, \angle ABC =60^o$. Find the length of the circle chord that divides angle $ \angle ABC$ in half. Median $AM$ and the angle bisector $CD$ of a right triangle $ABC$ ($\angle B=90^o$) intersect at the point $O$. Find the area of the triangle $ABC$ if $CO=9, OD=5$. Find the area of the section of a unit cube $ABCDA_1B_1C_1D_1$, when a plane passes through the midpoints of the edges $AB, AD$ and $CC_1$. Given a circle $\omega$ of radius $r$ and a point $A$, which is far from the center of the circle at a distance $d<r.$ Find the geometric locus of vertices $C$ of all possible $ABCD$ rectangles, where points $B$ and $D$ lie on the circle $\omega$ . Points $A, B$ and $C$ lie on the same line so that $CA = AB$. Square $ABDE$ and the equilateral triangle $CFA$, are constructed on the same side of line $CB$. Find the acute angle between straight lines $CE$ and $BF$. Let $ABCD$ be a parallelogram, such that the point $M$ is the midpoint of the side $CD$ and lies on the bisector of the angle $\angle BAD$. Prove that $\angle AMB = 90^o$. In the triangle $ABC$, $\angle B = 2 \angle C$, $AD$ is altitude, $M$ is the middle of the side $BC$. Prove that $AB = 2DM$. 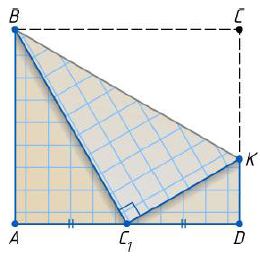 In the quadrilateral $ABCD$, the length of the sides $AB$ and $BC$ is equal to $1$, $\angle B= 100^o , \angle D= 130^o$ . Find the length of $BD$. In the trapezium $ABCD$ ($AD // BC$), the point $M$ lies on the side of $CD$, with $CM:MD=2:3$, $AB=AD$, $BC:AD=1:3$. Prove that $BD \perp AM$. In the quadrilateral $ABCD$, the points $E, F$, and $K$ are midpoints of the $AB, BC, AD$ respectively. Known that $KE \perp AB, K F \perp BC$, and the angle $\angle ABC = 118^o$. Find $ \angle ACD$ (in degrees). Construct triangle $ABC$, given the altitude and the angle bisector both from A, if it is known for the sides of the triangle $ABC$ that $2BC = AB + AC$. Let $I_a$ be the point of the center of an ex-circle of the triangle $ABC$, which touches the side $BC$ . Let $W$ be the point of intersection of the bisector of the angle $\angle A$ of the triangle $ABC$ with the circumcircle of the triangle $ABC$. Perpendicular from the point $W$ on the straight line $AB$, intersects the circumcircle of $ABC$ at the point $P$. Prove, that if the points $B, P, I_a$ lie on the same line, then the triangle $ABC$ is isosceles. The point $M$ lies inside the rhombus $ABCD$. It is known that $\angle DAB=110^o$, $\angle AMD=80^o$, $\angle BMC= 100^o$. What can the angle $\angle AMB$ be equal? Given a triangle $ABC$, in which $AB = BC$. Point $O$ is the center of the circumcircle, point $I$ is the center of the incircle. Point $D$ lies on the side $BC$, such that the lines $DI$ and $AB$ parallel. Prove that the lines $DO$ and $CI$ are perpendicular. Let $P$ the point of intersection of the diagonals of a convex quadrilateral $ABCD$. It is known that the area of triangles $ABC$, $BCD$ and $DAP$ is equal to $8 cm^2$, $9 cm^2$ and $10 cm^2$. Find the area of the quadrilateral $ABCD$. In the tetrahedron $SABC$, points $E, F, K, L$ are the midpoints of the sides $SA , BC, AC, SB$ respectively, . The lengths of the segments $EF$ and $KL$ are equal to $11 cm$ and $13 cm$ respectively, and the length of the segment $AB$ equals to $18 cm$. Find the length of the side $SC$ of the tetrahedron. Let $ABC$ be an acute triangle. A line, parallel to $BC$, intersects sides $AB$ and $AC$ at points $M$ and $P$, respectively. At which placement of points $M$ and $P$, is the radius of the circumcircle of the triangle $BMP$ is the smallest? $AH$ is the altitude of the acute triangle $ABC$, $K$ and $L$ are the feet of the perpendiculars, from point $H$ on sides $AB$ and $AC$ respectively. Prove that the angles $BKC$ and $BLC$ are equal. Point $O$ is the center of circumcircle $\omega$ of the isosceles triangle $ABC$ ($AB = AC$). Bisector of the angle $\angle C$ intersects $\omega$ at the point $W$. Point $Q$ is the center of the circumcircle of the triangle $OWB$. Construct the triangle $ABC$ given the points $Q,W, B$. The inscribed circle of the triangle $ABC$ touches its sides $AB, BC, CA$, at points $K,N, M$ respectively. It is known that $\angle ANM = \angle CKM$. Prove that the triangle $ABC$ is isosceles. Let $O$ and $I$ be the centers of the described and inscribed circle the acute-angled triangle $ABC$, respectively. It is known that line $OI$ is parallel to the side $BC$ of this triangle. Line $MI$, where $M$ is the midpoint of $BC$, intersects the altitude $AH$ at the point $T$. Find the length of the segment $IT$, if the radius of the circle inscribed in the triangle $ABC$ is equal to $r$.